Over a million records of open access publications from Latin America are now discoverable through the OpenAIRE platform. In December 2016, OpenAIRE began harvesting records from LA Referencia, the large regional repository network that aggregates metadata of open access publications. LA Referencia contains over 1.2 million records of open access content from nine countries in Latin America: Argentina, Brazil, Chile, Colombia, Costa Rica, Ecuador, El Salvador, Mexico, and Peru. The records provide access to the peer-reviewed journal articles and theses and dissertations in these countries across all research disciplines. This effort integrates the research outputs of the two regions and will significantly raise the visibility of Latin American publications outside the region. 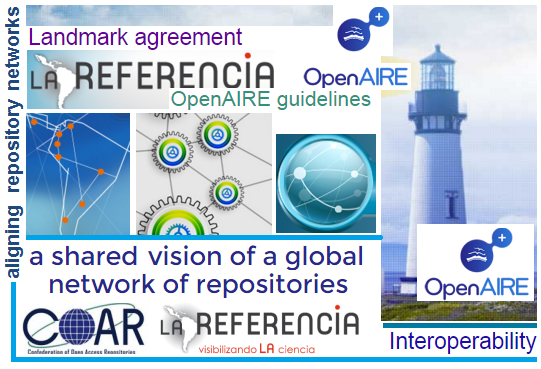 OpenAIRE and LA Referencia are two of the largest and most well-developed regional repository networks in the world. Together the two regions represent about half of the world’s open access repositories and a large portion of the world’s research output. Both regions are also well progressed in terms of open access, with strong open access policy environments and comprehensive repository coverage. Regional and national networks, such as OpenAIRE and LA Referencia, play a critical role in supporting open access because they create communities of practice, define standards, and maintain services that reflect the needs of their regions. Yet, the research enterprise is increasingly global, and regional networks must also give users a comprehensive international view. Sharing metadata allows networks to focus on their local communities, while still representing a fuller picture of research outputs. This activity builds on earlier collaborative efforts of the two networks, in partnership with COAR, to adopt common guidelines, technology transfer, and capacity building that helps to enable cost efficiencies across networks and ensure more seamless discovery and integration of content. COAR, OpenAIRE and LA Referencia have also been working with other regions to promote greater alignment and are working towards greater connectivity of research across the world. LA Referencia is the network of open access repositories from nine Latin American countries. It supports national open access strategies in Latin America through shared standards and a single discovery platform. LA Referencia harvests scholarly articles and theses & dissertations from national nodes, which, in turn, harvest from repositories at universities and research institutions. This initiative is based on technical and organizational agreements between public science and technology organizations (National Ministries and Science & Technology Departments) and RedCLARA. OpenAIRE, funded by the European Commission under H2020, is the Open Access Infrastructure for Research in Europe, based on the network of open access repositories and open access journals. OpenAIRE aims to promote open scholarship and substantially improve the discoverability and reusability of research publications and data. COAR is an international association with over 100 members and partners from around the world representing libraries, universities, research institutions, government funders and others. COAR brings together the repository community and major repository networks in order build capacity, align policies and practices, and act as a global voice for the repository community.